On September 24 a mix of flashes and different media personnel filled the Brooklyn Net’s Practice Facility to kick off the Brooklyn Nets’ media day. The Brooklyn Nets are gearing up for the 2018-2019 season, with both new and familiar faces filling out the training camp roster. All players were made available to speak on the upcoming season and the team’s direction. A popular theme that kept coming up in throughout the day was the idea of “team-based basketball.” Other topics that were covered were player’s roles and the ultimate impact they would have on the team. Some of the new additions to the team seemed excited to suit up for the Brooklyn Nets. One player who could not hold in his excitement was Kenneth Faried, who was traded to Brooklyn earlier this summer. The New Jersey native was happy for the opportunity to play so close to home. He repeated several times “this is my home,” as he entertained questions from the media. Some of the returning players spoke on their outlook on the season and how they could be better than last year. Sophomore Jarrett Allen spoke about how he worked on getting stronger and his shooting this off season. 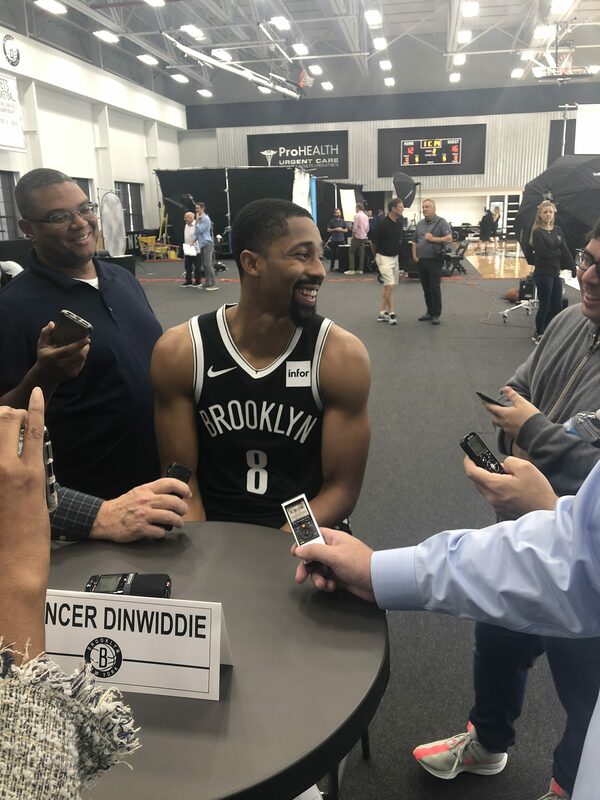 He also stated that what makes this season different than last is the fact the he “knows more about the game.” Fresh off his breakout season Spencer Dinwiddie is seemingly focused. Dinwiddie went to great length in clarifying issues on his spot on the roster. He further expressed the desire to remain with the franchise; however, if it wasn’t to happen it would be business as usual. Star guard D’Angelo Russell looks poised and confident to make being traded and injury plagued season a thing of the past. He started his first season with the team with strong performances but was soon sidelined after injuring and ultimately getting surgery on his left knee. Whether it was addressing free agency or letting media know he isn’t more important than anyone on the team. His answers were very team oriented and concise. When told he was viewed by fans as the face of the franchise his response was “cliché,” and he further stated “…becoming a leader isn’t something you can just say you are.” He expressed that he will lead by example. He is committed to elevating his game to gain trust from his teammates as the grow into a cohesive team.